Designed for the adventures of serious off road riding the MH.7 is equipped with Bosch`s Performance Engine, coupled to a 400wh (Range up to 75 miles) frame fitted battery, Shimano Deore 10 speed gear system, Suntour XCR suspension fork, FSA cranks, with stopping duties relying on the Shimano Hydraulic disc brakes and Schwalbe Rapid Rob 2.25 tyres an impressive equipment package! Finished in Matt Carbon Black Sizes: M.L. Ultimate Off road hardtail performance. 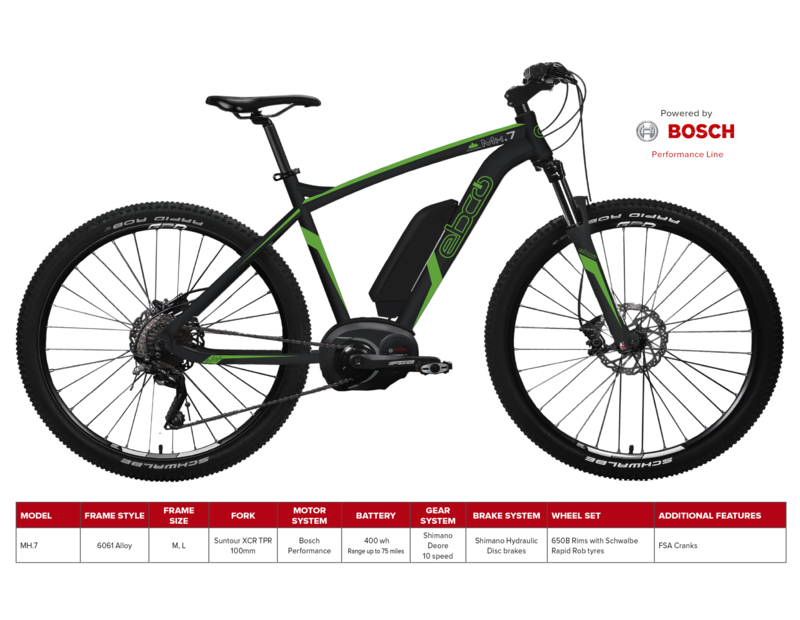 Bosch Performance Centre Drive motor with 4 power assist modes and incorporating the Purion handlebar mounted informative information center. Lithium-ion 36V 400WH Bosch frame fitting battery which locks securely and is removable for charging (charger supplied). Range: Up to 75 miles (Range depends on many factors including, levels of assistance, riding conditions, temperature, tyre pressure, and riders weight. Average effective battery life in excess of 12,000 to 15,000 miles of riding. Adjustable handlebar stem, comfort bars and grips, Selle Royal Saddle allowing fine tuning of your riding position.. Display: Bosch Purion display indicating battery charge status and 4 levels of power support, remaining range, speed and easy start function. walk assist feature. Weight of bike Inc. battery: 21.9kg approx.